NASA has awarded ExoTerra Corporation a $2.5M contract to demonstrate a novel solar electric propulsion system for CubeSats that will enable the shoebox-sized spacecraft to triple their available power and produce over 2.5 km/s of propulsion. 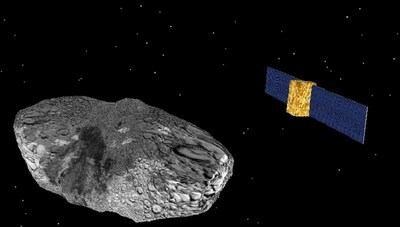 Under the “Utilizing Public-Private Partnerships to Advance Tipping Point Technologies” award, ExoTerra will use the mission-enabling capability to fly a CubeSat past an asteroid and become the first privately owned company to fly beyond the Moon. The mission will both demonstrate the solar electric propulsion technology in space for the first time, and support their partner, Deep Space Industries, in efforts to locate asteroids suitable for mining. The mission has ramifications for the commercial industry as well. ExoTerra’s Halo Hall Effect Thruster is less than half the size of competing systems and enables CubeSats to perform long-term orbit control for the first time. When combined with the high-power solar array, it enables CubeSats to perform reliable commercial operations with more capable sensor packages. ExoTerra is partnered with Deep Space Industries and Advanced Solutions Inc. on the project. They are scheduled to launch in late 2019. ExoTerra is a small business located in Littleton, Colorado. Founded in 2011, the company is focused on reducing the cost of space exploration and commercial space through miniaturization, high efficiency, and in-situ resource utilization. The company has successfully completed several NASA, Air Force, and commercial contracts regarding microsatellites, solar electric propulsion and in-situ propellant production.